In college, I remembered how much I had liked working in the library environment and decided to try and get a job at the local public library system. After I graduated, they hired me part-time to work in circulation. I loved it and started library school. While studying for my MLS, my branch manager promoted me to work in youth services as a paraprofessional. Not long after that, I graduated and starting looking for a full-time job as a librarian. After a few months on the market, I officially became a youth services librarian on January 6, 2009. Just over a year later, my mother sent me the link to an online obituary. Mrs. Gould had passed away. I wish I had called her before then to tell her that I became a librarian. I think she would have been thrilled. She had a true love of literature and it shone brightest when she would read us books. When I'm having a bad day, I try to emulate her. When I'm distracted by my love of technology and shiny things in general, I remember that it's really about the kids and the stories they need. Thank you for your example, Mrs. Gould. As a parent, I'm so happy that there are still school librarians like Mrs. Gould sharing their love of literature with kids. While my daughter unfortunately cannot have Mrs. Gould as her school librarian, I hope she will have someone like Travis Jonker, John Schu, or Matthew Winner, just some of the many wonderful school librarians in America, working in her school library. Today is my first day at my new job. I'm going to be working in the kids' department of a much bigger public library system than my most recent one. I'm excited. I'm nervous. I'm hoping that my hair looks OK and that the other kids will be nice and let me sit at their table (assuming I can even FIND the lunch room again--seriously, this building is huge!). I'm taking deep breaths. And, I know that, the most important thing is to remember that what I do is for the kids. And everything is going to be just fine. 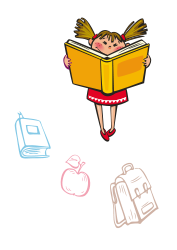 *Speaking of School Library Month, some of us bloggers are going to be celebrating by participating in Shelf Challenge 2013! We'll be trying to "deep read" through a segment of our collections (say, the H section of your picture books) to Better Know Them, as Stephen Colbert might say. You still have time to join us! Good Luck Anne! You'll be great! I have a feeling you going to be just fine! Enjoy your big day! Have a great first day Anne!